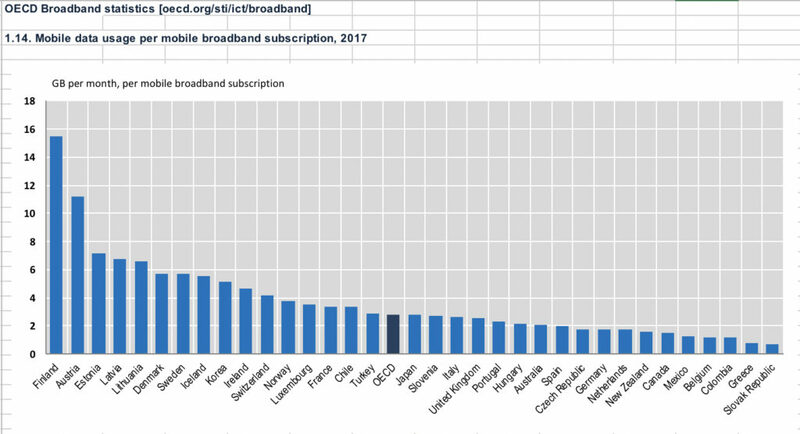 Second, Canada lags behind most OECD countries as measured by mobile data usage per broadband subscription. While the CWTA talks about consumption growing at an “astounding rate”, the reality is that Canada ranks near the bottom of the rankings of how much data is used per subscription. Canadian subscribers use an average of 1.54 GB per month, well below the OECD average of 2.82 GB. In fact, consumers in some OECD countries average 5 to 10 times more monthly data usage. The CWTA frequently claims Canada features fast speeds and reliable networks, but affordability is the only metric that counts for millions of Canadians that either cannot afford wireless services or conserve data out of fear of running up bills that are unimaginable in other countries.The impact of Canada’s uncompetitive wireless market does not stop with consumer use either as the fear of high costs ultimately decreases e-commerce sales, use of online government services, and the myriad of other benefits that come from the Internet. For a government already frustrated by the wireless market and the lack of CRTC resolve to address the issue, the latest OECD data further confirms the harm caused by a market that even troubles the Competition Bureau and the urgent need for government and regulatory action. This does not surprise me one bit. And as a middle class user of a smartphone, I am very conscious of how much data I use because going over my “limit” results in a bill at the end of the month that is so high it would make a Mafia loan shark blush in embarrassment. As a result, the only things I do on my smartphone is occasionally check for a business-related email and look at the weather forecast every morning. I don’t even have my personal email account on the phone and never use it to shop, stream video or do anything else other than to make calls. For example, a couple of months ago I made a couple of calls to people in the U.S. and exchanged a handful of text messages with them. As a result, my bill from Rogers nearly tripled from the $50 basic charge to $125! Outrageous. As for the trade association boasting of a 41% increase in data usage in a one year period, when starting from such a small base any increase will look huge. I am visit Croatia at this very minute and using one their providers. Using LTE and the 20gb bundle is 20kunas (about $4 CDN)/month package. In Canada I pay $65 for 2gb from Fido, we are getting robbed in Canada. The greed of our telcos and the lack of foresight by consecutive governments and a toothless CRTC has resulted in stagnation and lack of innovation. There is no demand for innovative technology that uses wireless data because it’s just too expensive. We have high speed LTE in our major cities, faster than most home internet, yet we can’t use it, so we cling to free wifi at cafes to avoid overusing our limited data. Wifi is still where it’s at. Forget mobile data in Canada, it’s just not going to happen. Sorry, I have no faith. As an old person, I am saddened to realize that I won’t live to see the day when telecommunications in Canada catches up to the rest of the world. I know very little and care less about this sort of topic, and agree that costs in Canada are very high. I read this blog post as an example of how Michael Geist is all too happy to twist plain data to serve his agenda. The high cost in Canada is undisputed. Let’s look at Geist’s claims for data usage in Canada compared to other developed countries. Ahead of only six other OECD countries, perhaps, but basically the same as the Netherlands, Germany, Belgium and Italy. These are hardly backwards countries, and any undergraduate reading these broadly similar data would conclude that there is no real story here. Here again we find in very close proximity to Canada, below the OECD average, countries such as Belgium, the Netherlands, Spain and Australia. In addition, the OECD average is obviously inflated by the extraordinary data from a handful of countries, with Finland for example sitting nearly seven times the average. Any objective reading of the data would conclude that there exists a large number of countries sitting in close proximity to each other and that the average is inflated by a small number of exceptional cases. Anyone care to recalculate the average by taking Finland and Austria out of the equation? They are obviously the odd men out, for whatever reason. As a university instructor, Geist knows how to do this and no doubt does it all the time, at least in his head, when looking at average student grades in courses: if you have 10 A students, 15 B, only 2 C, no D and 2 F, you calculate your average without the two F, which are exceptional cases possibly due to peculiar circumstances (illness, etc.). Peculiar circumstances must be at play in Finland and Austria, and it s misleading to factor them into broad comparisons. The moral is that Geist can’t even be trusted to do an impartial reading of pretty benign and transparent data. Everything is twisted. You’re absolutely correct when you say you know very little about this topic. Yet, you’ve got no reservations about commenting on that which you know little about, just to continue your childish trolling mission on Dr. Geist. Try responding to the issues raised. LOL. Pot kettle black much George? You’re a moron, you know that of course. I spell out all the reasons Geist can’t read a bar graph, someone calls me a troll, I suggest he address the issues I raised, and you say I should follow my own advice. Huh? I’m the only one on her raising issues. All I get is “troll, la la la” in response. I did respond to a key issue that keeps raising itself here. I’m sure everyone else would agree. ah wait, I’m the moron. I just noticed that the 41% mobile traffic growth between 2015 and 2016 is significantly less than the 52% mobile traffic growth across OECD countries in that same period. Occasionally, I get so carried away with my fanatic obsession over Mr. Geist that being argumentative becomes an end in itself and gives meaning to my lonely existence. Here, “George,” try reading some fact-based analysis for a change instead of swallowing whole everything Geist says and playing childish impersonation games. This is a good example of what happens when people who don’t know — don’t care to know? know but misrepresent? — statistics analyse data: with a flair of unfailing competence no less. The OECD claim is about growth — a *dynamic* concept. It is about consumption growth *across time*. The comparative data presented to refute the claim is *static* — it’s about consumption at a given point in time (across countries). Consider these two statistics: the growth rate of my consumption of apples across the last year, and my average consumption of apples compared to that of other members of my family (and the average for the whole family). Neither of these tells you *anything* about the other. I could have started from eating very few apples and thus have a huge consumption growth increase while still eating relatively few apples compared to other family members (below average). Or I could have an above-average consumption that hasn’t increased at all during the last year. Knowing my average consumption of apples tells you nothing about how much it has increased or decreased, just as knowing how much it has increased or decreased tells you nothing about where it is on average within my family. If you want to study my apple consumption in full, of course, you need to know both its dynamic and static aspects. So the way the post is written is at best clueless and at worst dishonest. And yes, taking out the extreme points of the distribution — as the post above suggests — is a standard robustness check at the very first stages of analysing any data. You’d think for our nearly quarter-million in salary paid to Mr. Geist – plus benefits, sabbaticals and job security for life – the Canadian citizen/taxpayer could get a little intellectual honesty and competence from our university professors. Data show that Canada is lagging below the OECD average, but with rapid recent growth it would be interesting to check back in in a year or two to see if this is still the case. In any event, our situation is not markedly different from several other highly developed countries – Benelux, Germany, Australia among others – in the areas analyzed by the data. Why can a public policy professor not do the same? Why can’t we get a little impartiality, a little perspective, a little intellectual honesty, for our money? Not to mention someone who knows how to read a bar graph. I took advantage of Rogers when they offered a deal of 10 gig plus unlimited Canada calling for $60/mo. They were trying to hold down Wind/Liberty who was offering $50 for 10 gig. But I see Americans offering unlimited gigs at a lower price than what we pay Rogers, Bell or Telus. We are getting gouged. No Doubt. Why do telecoms charge so much? For the same reason dogs lick their balls. Because they can. Yeah, it’s called groupthink. And your idea of a serious issue appears to be someone criticizing “Doctor” Geist. By the way, watch out, Ole Juul is going to call you a troll, you’re not using your real name (nor is Eric Lindros – and commically, ol’ Ole criticized me for not using my real name in exchanges with Eric Lindros – you can’t win with the witless, I tell you). As you yourself have said: “address the issues .” Anonymity is sometimes a legitimate requirement, but trolling is not one of them. In your case I suggest it is perhaps the rude and abusive language which you may not want to have associated with your real identity. ah, now your excuse for not addressing the issues is that I’m not. But I raised them, and no one, including you, has responded to them. Nice try. And I consider being called a troll as soon as I post a thoughtful comment full of ideas to discuss just as rude and disrespectful as anything I’ve said. It seems someone doesn’t want me to comment on this site anymore – could it be because of this perhaps? Think what you want George. You always do. But, it’s cute that you’re apparently asking questions at this point. “Try addressing the issues” – in Sookman, for example. One by one. Each point. You’re all afraid, so you laugh, you call people trolls, la la la.